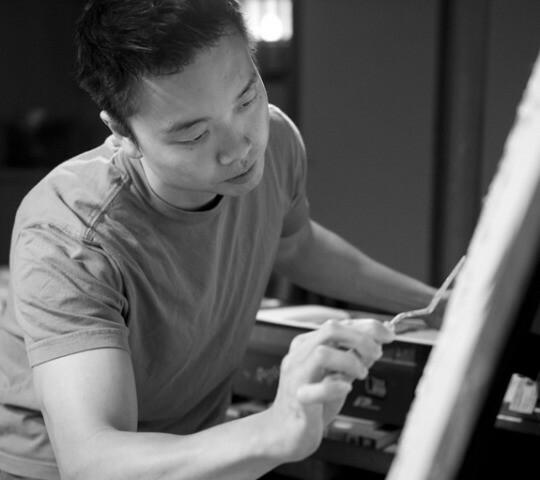 REACTOR will be hosting fine artist, Allan Chow, for our May First Friday show, Curvaceously Complete, where a collection of his still life paintings will be displayed. Allan paints with a palette knife, applying thick impasto in brilliant colors found only in dreams. His emotions and passion pour through his spontaneous, yet controlled, brushstrokes, creating a three dimensional experience for his audiences. During his exhibitions, viewers find it difficult to resist the temptation to touch his paintings. With his sophisticated style and obvious passion for painting, Allan has established an international following. Represented by the Leopold Gallery in Kansas City, Missouri and Strecker Nelson Gallery in Manhattan, Kansas, Allan is a highly regarded painter of abstract landscapes and unique still live paintings – all inspiring subjects. Allan’s original paintings and prints belong to such prestigious Kansas City area collections such as H&R Block, the Kansas City Royals, Kansas City Chiefs, BKD, Lewis, Rice and Fingersh Law Firm, the Overland Park Convention Center, the University of Kansas Medical Center, University of Missouri-Kansas City, Russell Stover Candies, and the Kauffman Foundation. The show is on May 1st from 5-9 PM at REACTOR (1817 Grand Blvd, KCMO 64108). For more information on the show visit the Facebook event page. If you are interested in purchasing a piece, commissioning the Artist, and/or viewing some samples of his paintings, visit Allan’s website.